April 2013 – CREATE. PLAY. TRANSFORM. This happened to me in January this year. A brand new year has just come, and I am all inspired, by not knowing, what great things will come in 2013. Unexpected surprises are what I am after at all times. Having an almost perfect plan can sometimes cause problems and discouragements. Having a childish heart, filled with hope, has never failed me. Life is good when seeing it with a child-like faith. Nelfa Querubin-Tompkins, sent me an e-mail with these words: “I am coming to Manila. I wish we could get together. I will have a series of shows, but I would like to see what you are doing.” I got all excited after reading her name in the e-mail. I always look forward to seeing Nelfa. She has become a very dear friend and an inspiration. I have not heard of a similar story like hers. 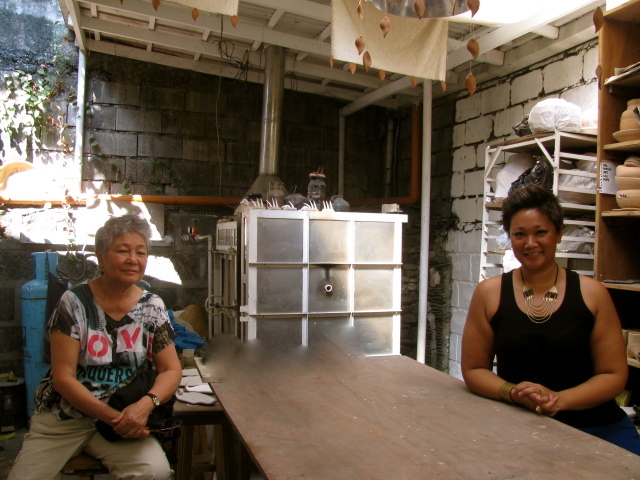 She lived through her life’s ups and downs, by putting all her energy with her clay and firing her kilns. Whenever Nelfa visits Manila, she stays in the university hotel (U.P. Hotel). We would always meet there and have dinner at the hotel cafe. We both like their seafood Kare-Kare. She would always tease me, “You don’t have to finish all that rice.” Sometimes she’s too honest like that. We would chat for endless hours. I would only leave her, when I see that she is starting to yawn. There were times when I would yawn first and she would ask me to go home and rest. Conversations with Nelfa are all stored in my heart. Stories about life are exchanged. Stories that maybe, only the two of us, know about one another. She’s seventy three years old and I am thirty five. Our age gap is not an issue between us. I can relate to her. She can relate with me. We both laugh out loud, and we know when to get all serious. On top of all the pottery techniques that we both know, she teaches me more about living life as a Potter and living it with faith. Being impressed by her works is not even half of the reason why I love her handmade Ceramics. Each of her work has a story. It is not only a piece of glazed pottery. She went through depression and excessive joys in her life, that has brought her, to creating her masterpieces in clay. More stories about her works will be written in the following articles. During Nelfa’s visit in Manila, I went to Clay Ave with her. 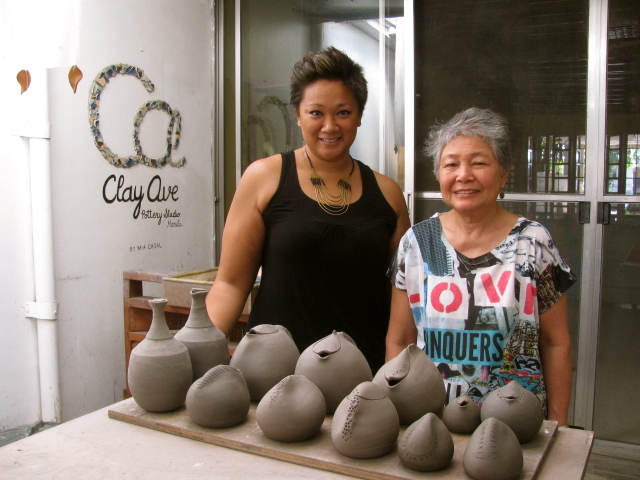 I picked her up from the same hotel and I accompanied her to my humble pottery studio in Blue Ridge, Quezon City. I feel like a little child, showing her mom, a beautiful place, my happy place. It’s an honor to have her around. I introduced her to the homeowners, and they were stunned by her presence as well. Nelfa is meek. Nelfa is strong. I was preparing for Art In the Park when I brought Nelfa to Clay Ave. She was able to see some of my handmade works. Everytime she would hold my pieces, my heart would skip a beat. I get all nervous when she gives her honest opinion about my pots. She is a critic. After seeing thousands of pots through the decades of her life as a Potter, telling lies to please people is not what you can expect from her. She gives suggestions and she encourages young artists with so much passion. Nelfa’s youthfulness didn’t leave her with salt and pepper hair. She has aged and she is aging well and gracefully. Just like clay, when stored for a very long time, it will function so much better than a fresh batch of mixed, raw, clay. Nelfa: Thank You for setting aside time with me early this year. I cherish every minute spent with you in the U.P. Hotel, in Clay Ave, Manila Art Fair, our crazy cab rides in Manila, the time when I picked you up from the hotel for the opening of your show, “Terrain”, at the Ayala Museum, our trips to Izukan and Art Informal Galleries, the meals we have shared together, our drive home from Liongoren Gallery, our exchange of e-mails, and inspirational stories that make us continue to breathe in life today. What I cherish the most, is our silence together. 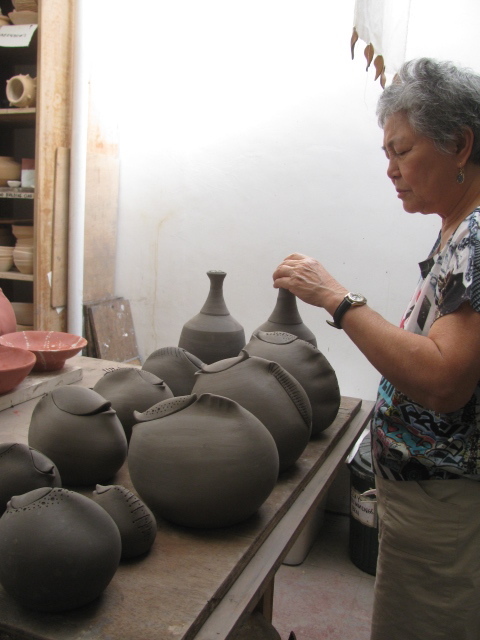 Thank You for your words of encouragement and wisdom in pursuing the unpredictable world of Pottery in The Philippines. We pursue it because it is a gift. Freely-given. Equally shared.